If you have chosen to homeschool in Maine, you may need information, resources, and curriculum that will help you get started. This page aims to help guide you through the process of homeschooling in the Pine Tree state. 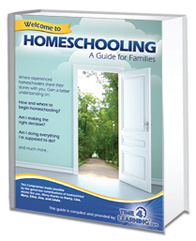 Take a few minutes to read through it, and feel free to share this page with other new homeschoolers in your state. If you have questions or comments about homeschooling in Maine, check out the homeschooling tools and resources or visit the online Maine support group. Maine is a great place to homeschool. The laws are easy to understand and follow. There is a very active homeschool community in the Portland area, and many hardworking parents do a great job in organizing activities for children. There are two different options for homeschoolers in Maine. The first one is to register with the state as a homeschooler. The other option is to join a non-approved private school, which then registers with the state. With both options, you do not have to do anything until your child is 7-years-old, which is the compulsory age in Maine. For more information on legal issues relating to homeschooling in Maine, you may consult the legal statute for the state. If you have any more questions or comments about homeschooling in Maine, head over to the Maine Parent Forum.